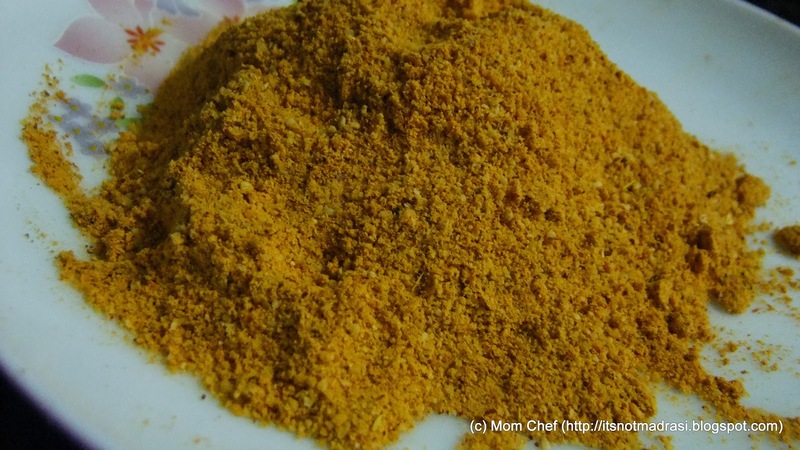 Historically, flavoured powders -podi (Tamil) / pudi (Kannada)have been part of South Indian Cuisine, particularly in the states of Andhra Pradesh, Karnataka, Tamilnadu. Andhra has its share with pappu pudi (powdered lentils) which goes well with rice and ghee, and is a great starter with its fiery red chilly powder giving way to Gonghura thokku (another oil-based chutney made of Gonghura leaves) also mixed with oil and eaten with rice. Karnataka is famous for Chutney pudi (which goes well with akki rotti, rice equally) and I remember mom and grandma making these by the gallon and packing it for the cousins and relatives who wanted to carry a whiff of homeland and comfort food with them to wherever they were travelling. · Dry Red Chilles (not Kashmiri variety) – 6 nos. 1) In a dry pan, fry the sesame seeds till they pop slightly and transfer before they brown. 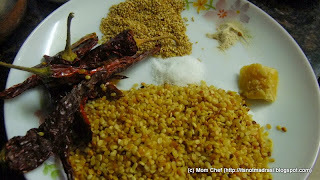 3) Now grind the Urad dal and chillies to a coarse powder, add salt , jaggery and hing and grind once more till almost smooth powder. 4) Now add roasted sesame seeds and grind only once. 5) Cool the powder for about 3 – 4 mins and store in an air tight container. 6) This will make about 150 – 200 gms of powder. 7) Serve this with Idli / Dosa by adding a teaspoon of sesame oil to one tea spoon of Molagapudi and mix it well. 2) Be sure to add the sesame seeds only in the end and to grind only once, else the seeds will leave out oil which will spoil the quality and texture of the powder. Thanks for the yummy podi Kalyani..